In recognition of Belmont Hill's four recent endowed faculty chair recipients: Chris Richards, Ken Martin '65, Bob Brownell, and Chris Butler. When friends of Belmont Hill establish endowed chairs, they make powerful statements both about the faculty and to the faculty. They remind all of us that our teachers implement Belmont Hill’s mission, exemplify the School’s traditions, and deserve the greatest respect. The generosity of our donors, even as they help build the School’s endowment, allows us to honor great faculty members who have served Belmont Hill so admirably. Endowed chairs, which are typically awarded for a five-year period, establish a continuing legacy for the donors, while sending a strong message of support regarding those responsible for instructing, counseling, and coaching our boys. Established in 2000 by Bill Byrnes ’40 and Randy Byrnes ’65 to honor a faculty member for excellence in the teaching of language, literature, philosophy, history, or the arts and for a broad commitment to students and school life. Established in 2001 by Chris Clifford, Copey Coppedge, and Ken Richardson ’67 to honor a faculty member for excellence in the teaching of mathematics and for a broad commitment to students and school life. Established in 2007 in memory of Tom Fuss ’07 by his parents, RoseMary and Dan Fuss, this chair honors a faculty member for excellence in the teaching of science and for a broad commitment to students and school life. Established in 2012 by Nelson Darling ’37 to honor a faculty member for excellence in the teaching of language, literature, philosophy, history, or the arts and for a broad commitment to students and school life. Established in 2014 by Marjorie and Jerry Drucker, Michael Drucker ’86, and Jeff Drucker ’90, this chair honors a faculty member early in his or her career for talent and dedication to teaching and for a broad commitment to students and school life. Established in 2015 by Lyn and Tod Rodger and friends to honor a faculty member for excellence in the teaching of mathematics and for a broad commitment to students and school life. 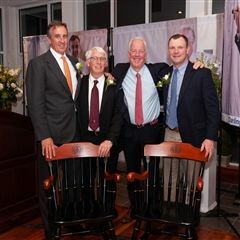 Established in 2017 in memory of Maggie and John Ryan by the Ryan family—Ann, Tony, Matthew ’14, William ’17, and Thomas ’19—this chair honors a faculty member who exemplifies an ideal embraced by the School since its founding: excellence as both a teacher and a coach. Established in 2018 by an anonymous Belmont Hill family to honor a faculty member for excellence in the teaching of history, and for inspiring a spirit of open inquiry, good citizenship, and greater understanding of our world.